I am wondering if someone is given the application designer rights through menus, will the person be able to make use of the rights? 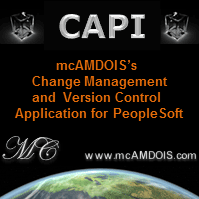 I understand that there is a need to install peopletools as application designer cannot be assess through the web. Can peopletools be easily installed and use on a client pc? Yes, you do need PeopleTools installed and configured on your local PC in order to use application designer. It isn't that hard to install as you can just copy the relevant files from the PeopleSoft file server. It can however be difficult to configure, particularly if you don't know the environment details such as the PeopleSoft connect password. This wiki article explains how to install PeopleTools locally. You can see its not that difficult to do if you have some technical knowledge about PeopleSoft and the environment you are connecting to.